Here they are: our new Streams. We aimed to combine maximally user-friendly functionality with lean and smooth design. That was just the job for our front-end development team, with their expertise in User Interface and User Experience Design and their affinity with flat design. Now, our Streams look calmer to the eye: they are outlined more fittingly, and round corners and shadows disappeared. We also paid a lot of attention to making our platform easier and faster to work with. We aimed to reduce the number of clicks needed for as many operations as possible. Therefore, we integrated many functionalities in the messages screen, by replacing pop-ups with icons in the Streams themselves. This allows you to catch the sentiment of a message at a glance. In addition we developed short-keys for many functions that users could previously only select in several steps. With these, users can avoid many of the old clicking detours and work faster and more efficiently. For example: labelling a message took a couple of clicks before, but now users can link one of the three most popular labels to the message by using one short-key. Note that the task-assigning process has undergone another improvement: instead of having to click around to assign a message or a task to yourself , you will see a hand-icon next to each message on mouse-over, with which you can assign the message to yourself in just one click. What else did we improve? The message flow looks much calmer and that is certainly more convenient for your eyes. More messages fit on the screen now, requiring significantly less scrolling. As a positive side-effect, the Streams load more quickly as well. 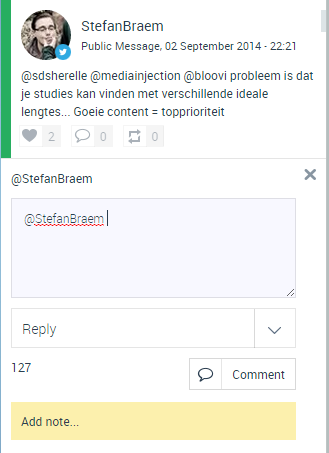 To improve users’ workflow, in the new Streams we added the option to take notes directly under the message. Here you can add for instance a telephone number, email address, postal code or a personal comment about the customer. Furthermore, the conversation history is now included in the Streams, to provide better overview. Notes and conversation history allow you to quickly check the status of a message, and see how many messages are contained in one Stream. If you work with labels and tasks, filtering the Stream with these will show you how many messages within the task or label are still ‘open’. The new Streams is part two of the renovation of our platform. The team is already busy improving the next part: the Overall Dashboard.